Wipe sensitive data on disk drive volumes or disk partitions. 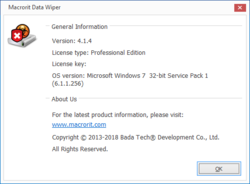 Macrorit Data Wiper Pro Edition 2018 4.1.4 (Local & Portable) was available as a giveaway on June 24, 2018! Data Wiper is also capable of creating bootable media for users who want to wipe hard drive before booting into Windows. 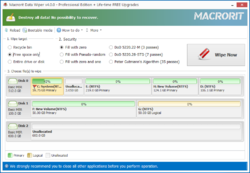 How would you improve Macrorit Data Wiper Pro Edition 2018 4.1.4 (Local & Portable)? This software show's great promise. I commented in another giveaway on a different site that I think they need to really include two things to make this software better to compete with rivals. 1st : It needs a right click in the context menu to securely delete single files and or folders with files in them so you don't have to load the software up to do such things. There is no need to have the software loaded to do those things at all, makes no sense to not have that option. 2nd : A scheduling option would be nice to be able to clean out the recycle bin every night, or the folder or files of your choice. One addition that you don't find in other erasing software that I think they should add is the ability to define extensions for certain file types in folders. For example, less say a folder is called "Junk, and you want to ONLY delete the .exe or .txt files from that folder ONLY", I have not seen a file erasing software yet that can or does do that. 3rd : I really like Macrorit the company, they were kind enough to take the time to respond and reply to me on a previous giveaway on another site, which I am using the same version offered here, and I appreciate that because it shows their willingness to follow up with the people who purchase or use their software. Very professional! This software show's great promise. I commented in another giveaway on a different site that I think they need to really include two things to make this software better to compete with rivals. 1st : It needs a right click in the context menu to securely delete single files and or folders with files in them so you don't have to load the software up to do such things. There is no need to have the software loaded to do those things at all, makes no sense to not have that option. 2nd : A scheduling option would be nice to be able to clean out the recycle bin every night, or the folder or files of your choice. One addition that you don't find in other erasing software that I think they should add is the ability to define extensions for certain file types in folders. For example, less say a folder is called "Junk, and you want to ONLY delete the .exe or .txt files from that folder ONLY", I have not seen a file erasing software yet that can or does do that. 3rd : I really like Macrorit the company, they were kind enough to take the time to respond and reply to me on a previous giveaway on another site, which I am using the same version offered here, and I appreciate that because it shows their willingness to follow up with the people who purchase or use their software. Very professional! 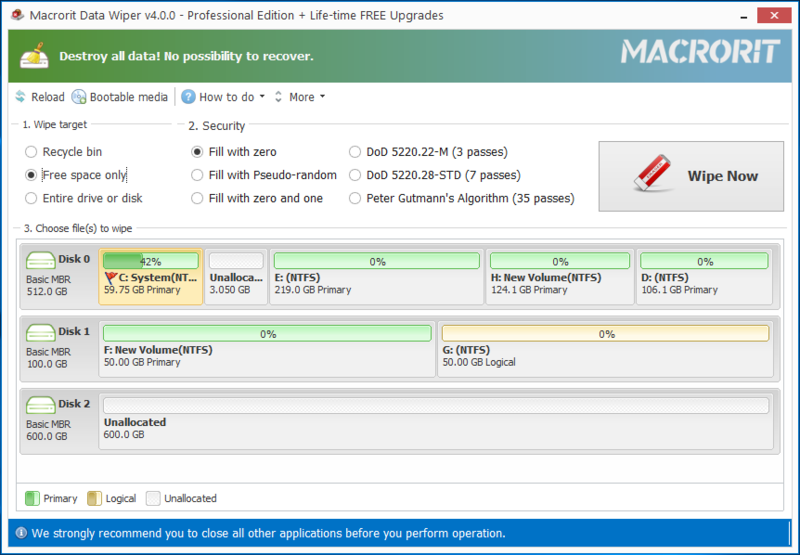 It works very fast at securely deleting free space which is what I use it for, MUCH Better than CCLEANER TOOLS Free Space delete and WITH MORE OPTIONS! And it actually works. I tested it with some commercial pro recovery software's and it made it impossible to recover what I had deleted with the higher settings. I've read reviews on secure delete software's of people saying you cannot securely delete things from your hard drive, but yes you can, the people saying that are people wanting to discourage you and the general public from doing so because they figure if everybody starts securely deleting the software they wont be able to charge people for viewing a web page! Or whatever that is........ Thanks Macrorit & GOTD! Bob, I said "securely deleting the software" at the end of my post, I meant. Files. "I tested it with some commercial pro recovery software's and it made it impossible to recover what I had deleted with the higher settings." You really really really do not need any fance millitary graded cleaning algorithm to permanently remove files. 2) How those passes are written... byte per byte,... or a bit smarter: sector per sector or even bigger chunks. We use Glary Utilities Pro and free 1 year licenses are being given away at Glary Software. It works for us, it could work for you too. We use Glary Utilities Pro and free 1 year licenses are being given away at Glary Software. https://www.glarysoft.com/giveaway/index_gu_ksm.php It works for us, it could work for you too. Why no custom passes? like write pseudo-random followed by zeros on second pass to return surface to as new and make any newly installed operating systems partition free space very compressable. Also why no individual file or folder plus cluster-tip and Alternate data streams wipes/erases? Why no custom passes? like write pseudo-random followed by zeros on second pass to return surface to as new and make any newly installed operating systems partition free space very compressable. Also why no individual file or folder plus cluster-tip and Alternate data streams wipes/erases? Indeed, and as for the 'cluster-tips': that should be made as an additional option (and by default 'on') for _any_ type of wipe. Not like in some other wipe-tools as a completely seperate wipe-method. where is the portable version in the zip file?
. 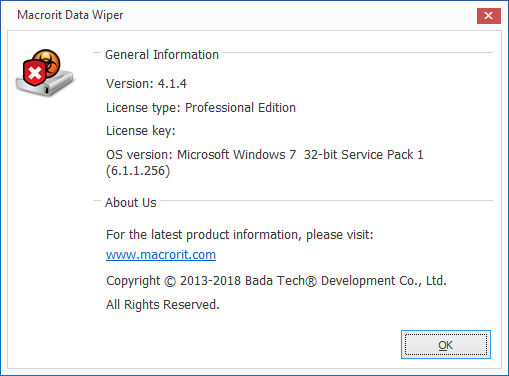 [ Bob Edwards ], ...\MacroritDataWiperProEdition2018414LocalPortable-ajs8l0\mwiper-pro-portable\x64\dm.wiper.exe and \MacroritDataWiperProEdition2018414LocalPortable-ajs8l0\mwiper-pro-portable\x86\dm.wiper.exe . I am just downloading. Will get back to you on feedback. Thanks. Not high DPI compatible on 64-bit version. Usable, but blurry. 1 - Is your resolution set to recommended / native? 2 - Are your fonts set to 100% ( not 125% or larger )? 3 - Are you happy using this by changing to a lower screen display resolution first?
. [ Clairvaux ], 1 - Is your resolution set to recommended / native? 2 - Are your fonts set to 100% ( not 125% or larger )? 3 - Are you happy using this by changing to a lower screen display resolution first? . Oh, no ! My scaling is at 150 %, and I need this. 100 % is unreadable. That's what throws badly-behaved programs out of their tracks. Yes, many people purchase gear that is inappropriate for their preferences right out of the box, then they tweak it to make it custom and non-standard, and then they wonder why it's not standard. There are at least 7 ways to change display screen information size -- your method of choice is non-standard, even though it comes from Microsoft, the king of non-standard. However, if today's GOTD program works at 100% font size, then you've identified how to use this program, so give it a try and let us know ... then revert to 150% font size immediately afterwards, because this program only needs to be run once to make a bootable CD, then one never needs to run it again. There is no need to install this program, since the portable version works fine, and, again, all we need to do is run it once, and not even that, since free Image Burn and other ISO burners can burn a CD from the ISO in today's giveaway, there is no need to ever run today's GOTD program, so, 32-bit and 64-bit installations are absolutely irrelevant. Most of our challenges are getting out of our own way, as testified to by today's GOTD in the first place, for people who not only set a password on their own computers ( geesh ! ), but then have no way of remembering their own password ( double geesh ! ), and then have to learn how to break into their own property ( triple geesh ! ), and still don't learn that crackers don't care about passwords, so the very same users of today's GOTD will go right ahead anyway and put yet another forgettable password on their computer ( quadruple geesh ! ).
. [ Clairvaux ], Yes, many people purchase gear that is inappropriate for their preferences right out of the box, then they tweak it to make it custom and non-standard, and then they wonder why it's not standard. There are at least 7 ways to change display screen information size -- your method of choice is non-standard, even though it comes from Microsoft, the king of non-standard. However, if today's GOTD program works at 100% font size, then you've identified how to use this program, so give it a try and let us know ... then revert to 150% font size immediately afterwards, because this program only needs to be run once to make a bootable CD, then one never needs to run it again. There is no need to install this program, since the portable version works fine, and, again, all we need to do is run it once, and not even that, since free Image Burn and other ISO burners can burn a CD from the ISO in today's giveaway, there is no need to ever run today's GOTD program, so, 32-bit and 64-bit installations are absolutely irrelevant. Most of our challenges are getting out of our own way, as testified to by today's GOTD in the first place, for people who not only set a password on their own computers ( geesh ! ), but then have no way of remembering their own password ( double geesh ! ), and then have to learn how to break into their own property ( triple geesh ! ), and still don't learn that crackers don't care about passwords, so the very same users of today's GOTD will go right ahead anyway and put yet another forgettable password on their computer ( quadruple geesh ! ). .
Who are you, Mister Peter Blaise, to be so rude and so snarky ? Who is that "us" you mentioned, when you asked to let you know ? Do you represent Macrorit here, or are you just a garden variety troll, trying to ruin their reputation pretending to be helpful, then berating people for using their own computers the way they need to ? The DPI setting I use is no business of yours. Not unless you're willing to help, which you obviousy are not. And anyway, there's nothing you can do to help. This program, as many, many others, is not high DPI-aware, and other users might be interested to know (at least 7 of them have said so). The only way for this defect to be corrected is for the developer to make the necessary changes. 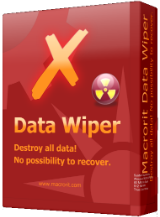 Who told you I installed Macrorit Data Wiper Pro, anyway ? Who told you I did not use the portable version ? And what's that irrelevant rubbish of yours about passwords ? Who are you, Mister Peter Blaise, to be so rude and so snarky ? Who is that "us" you mentioned, when you asked to let you know ? Do you represent Macrorit here, or are you just a garden variety troll, trying to ruin their reputation pretending to be helpful, then berating people for using their own computers the way they need to ? The DPI setting I use is no business of yours. Not unless you're willing to help, which you obviousy are not. And anyway, there's nothing you can do to help. This program, as many, many others, is not high DPI-aware, and other users might be interested to know (at least 7 of them have said so). The only way for this defect to be corrected is for the developer to make the necessary changes. Who told you I installed Macrorit Data Wiper Pro, anyway ? Who told you I did not use the portable version ? And what's that irrelevant rubbish of yours about passwords ? The tech world from magazines in the early 1980s to the Internet in the early 1990s has been trying to help people overcome Microsoft's non-standard undocumented inconsistent way of doing things since the [ Print ] command was the first TSR terminate and stay resident program, totally against Microsoft's own "rules" -- 150% font size at least comes with some warnings, but you'll find no documentation on how it's implemented, hence folks often suffering from yet another Microsoft hubris-attack. "Us" is everyone on this GOTD thread who are trying to share their experience of today's offering, and are trying to help each other -- you're welcome. When someone writes "... Not high DPI compatible on 64-bit version. Usable, but blurry. ..." ... "not compatible" means "does not work", hence responses offering ways to try to get it to work. If anyone meant "... not high DPI aware, and so it appears accurately but tiny on-screen ..." or whatever "... blurry ..." means -- perhaps at Microsoft's undocumented 150% font setting ( not DPI ), some program presentations are not rendered smooth? -- then it makes sense to offer remedial suggestions. No one has to respond to remedial suggestions and discussions cascading from the presence of their posts in a world-wide discussion thread, but an occasional "... thanks for your thoughtful suggestions ..." would be nice now and again.
. [ Clairvaux ], The tech world from magazines in the early 1980s to the Internet in the early 1990s has been trying to help people overcome Microsoft's non-standard undocumented inconsistent way of doing things since the [ Print ] command was the first TSR terminate and stay resident program, totally against Microsoft's own "rules" -- 150% font size at least comes with some warnings, but you'll find no documentation on how it's implemented, hence folks often suffering from yet another Microsoft hubris-attack. "Us" is everyone on this GOTD thread who are trying to share their experience of today's offering, and are trying to help each other -- you're welcome. When someone writes "... Not high DPI compatible on 64-bit version. Usable, but blurry. ..." ... "not compatible" means "does not work", hence responses offering ways to try to get it to work. If anyone meant "... not high DPI aware, and so it appears accurately but tiny on-screen ..." or whatever "... blurry ..." means -- perhaps at Microsoft's undocumented 150% font setting ( not DPI ), some program presentations are not rendered smooth? -- then it makes sense to offer remedial suggestions. No one has to respond to remedial suggestions and discussions cascading from the presence of their posts in a world-wide discussion thread, but an occasional "... thanks for your thoughtful suggestions ..." would be nice now and again. You're welcome. . The portable program is exactly the same as the free portable version. It has very few features compared to the Pro Edition. The portable program is exactly the same as the free portable version. It has very few features compared to the Pro Edition. This is disappointing. Did you register the portable version using today's GOTG license?
. [ Duane ], Did you register the portable version using today's GOTG license? . I would add the capability to wipe a single file from a directory or sub-directory. 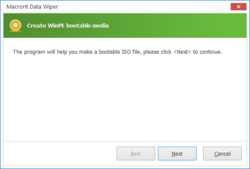 Karl K, thanks for the advice, we planned to add that function, but for security reason, we released the `Wipe recycle bin` feature instead, may take you one more step to wipe the file clean (delete it first, then wipe it), but secure. Wipe Free Space fill with Pseudo-random only writes 01hex itself. On the compression disc very slowly. Error on WXPSP3Eng 32b. Wipe Free Space fill with Pseudo-random only writes 01hex itself. On the compression disc very slowly. Error on WXPSP3Eng 32b. JardaH, Just out of curiousity, why are you still using a compressed disc? Nothing is designed now days to work with such things. I remember the old days using Superstor and other compression options, which I realize there are options to compress disc now days which are much more improved, but my argument to that says quite simply : "If compressing your disc or hard drive was a good idea then it would be the standard for all system's here in the modern era". Macrorit, version 4.2.0 portable is fine, thank you, especially for a quick response. JardaH, Glad you like it, thank you for the feedback too. Since all of the supposed security wiping of data is based on overwriting of the previous data, it is easy to do it yourself without any software. Just delete the files you want removed, keep the folders and copy into them video, audio files or any irrelevant data to overwrite the volume of the folders, all done and no data can ever be recovered from any previous wipes. I have been doing this for a decade and have challenged hackers to recover the previous wipe(s) and always I won the bet. Since all of the supposed security wiping of data is based on overwriting of the previous data, it is easy to do it yourself without any software. Just delete the files you want removed, keep the folders and copy into them video, audio files or any irrelevant data to overwrite the volume of the folders, all done and no data can ever be recovered from any previous wipes. I have been doing this for a decade and have challenged hackers to recover the previous wipe(s) and always I won the bet. Hanry, Have you ever heard of what is know as "Shellbags"? You might want to rethink that logic. There is always a record of whatever you are doing unless you securely remove it. Although, that being said, Macrorit and no secure delete software mentions the removal of "Shellbags" from the system, so activity is still kept. Privazer is the best solution to date, PERIOD! Although you need to take some time to learn about it. There are two menu's on Privazer, the first being a big blue "Clean function" that just clenas internet traces and such, the other one is above it and both are on the right of the screen and that one cleans free space. When installing go through the tutorial and learn about it and make selections carefully. Just thought I would mention this, because like I said, it does you no good to delete the files if there is a "ShellBag" record left showing where you got to begin with, SECURELY DELETE FILE OR NOT, the record is still there. .
Hanry, Have you ever heard of what is know as "Shellbags"? You might want to rethink that logic. There is always a record of whatever you are doing unless you securely remove it. Although, that being said, Macrorit and no secure delete software mentions the removal of "Shellbags" from the system, so activity is still kept. Privazer is the best solution to date, PERIOD! Although you need to take some time to learn about it. There are two menu's on Privazer, the first being a big blue "Clean function" that just clenas internet traces and such, the other one is above it and both are on the right of the screen and that one cleans free space. When installing go through the tutorial and learn about it and make selections carefully. Just thought I would mention this, because like I said, it does you no good to delete the files if there is a "ShellBag" record left showing where you got to begin with, SECURELY DELETE FILE OR NOT, the record is still there. .
1) "delete the files, keep the folders and copy into them video files etc" <= useless.... It does not matter that you copy large files into those folders. You can copy those files anywhere if you want to do it manually like that. It does not have to be "in those folders" specifically as that is not at all how disc/file allocation works in modern OSs. 5) All that crap about security wiping is EXTREMELY overrated! There has been NO recorded case in history of data being retrieved from a drive which was not wiped with those so called millitary graded wipes. In fact, even some of the inventors of those methods explain why that is + there is a lot of research done on this confirming it (search the net). In fact, if you delve into this, you learn that there are even outstanding rewards for those who can proof to have recovered meaningfull data from a wiped disc. Nobody has ever claimed one of those rewards to this day. It is all theoretical possible, not practically possible. All those methods were developped when drivers had a massive smaller track and data density. For modern drives, those methods are completely useless and thus serious overkill and only deteriorate your drive even more! All modern drives (non SSD that is!) can safely be wiped with just overwriting with a 1-pass zerofill, you don't need any fancy multi-pass algorithm for that. 6) Another much forgotten area on your drive by such programs as offered today are the 'slackspaces' on your drives or sectortips; the space where your file ends and where the next sector/file begins. Hanry, 1) "delete the files, keep the folders and copy into them video files etc" <= useless.... It does not matter that you copy large files into those folders. You can copy those files anywhere if you want to do it manually like that. It does not have to be "in those folders" specifically as that is not at all how disc/file allocation works in modern OSs. 2) For the method described, you need to be VERY lucky if by copying large files you end up overwriting the old data. Again, that is not how modern disc/file allocation works. You can only be 'certain' that all data will be overwritten if you fill the ENTIRE hard disk so that you have 0 bytes left. Note: and even then, there is always space on the drive you can not access using normal file operations, which is used by Windows to store temporary/cache data. This said, I don't know any so called wipe-program that actually take that system space into account anyways.... 3) In order for that manual method to work 'kind-of': do not delete the files you want to be removed! Instead directly overwrite them with a rnadom file with the same or bigger size. Not removing the file first, is crucial here. But even then, the OS might decide to put your (new) file somewhere else on the physicial disc and leave the (old) data untouched... So, either way, this method wont work in most cases (unless, you really fill the disc until there is 0 bytes free.... but even then) 4) The ONLY way to make certain your old data is gone, using a manual method, is by actually EDIT the filedata yourself with a disc- or hexeditor (and hope there isn't any cache data stored in the OS's reserved places) 5) All that crap about security wiping is EXTREMELY overrated! There has been NO recorded case in history of data being retrieved from a drive which was not wiped with those so called millitary graded wipes. In fact, even some of the inventors of those methods explain why that is + there is a lot of research done on this confirming it (search the net). In fact, if you delve into this, you learn that there are even outstanding rewards for those who can proof to have recovered meaningfull data from a wiped disc. Nobody has ever claimed one of those rewards to this day. It is all theoretical possible, not practically possible. All those methods were developped when drivers had a massive smaller track and data density. For modern drives, those methods are completely useless and thus serious overkill and only deteriorate your drive even more! All modern drives (non SSD that is!) can safely be wiped with just overwriting with a 1-pass zerofill, you don't need any fancy multi-pass algorithm for that. 6) Another much forgotten area on your drive by such programs as offered today are the 'slackspaces' on your drives or sectortips; the space where your file ends and where the next sector/file begins. when would I use this? Often wondered about this kind of software. george j Ducas, Clean up before you sell your device. If you get really nasty malware, ransomware, virus or trojan. gb, there must be a folder called mwiper-pro-portable in the zip file you have downloaded. 1 - Make a Windows Boot USB drive using a self-provided utility ( search Google ). 2 - Copy the portable version of today's GOTD to the USB drive. 3 - Boot the USB drive and un the portable version from there.
. [ gb ], 1 - Make a Windows Boot USB drive using a self-provided utility ( search Google ). 2 - Copy the portable version of today's GOTD to the USB drive. 3 - Boot the USB drive and un the portable version from there. .
Macrorit creates great s/w, and Data Wiper is no exception. Please give us more from this vendor, either giveaway, shareware or paid. Software easy to install and use. Useful to keep privacy. A plus with the possibility to make a bootable media,, the whipping of recycle bin, and a portable version. A keeper for me. Dufas, Detenova & Dufas the word is wiping. You're not whipping your wiping and it is two ps. Is it possible in some way to recover viped hard drive. what program can recover vipped data? 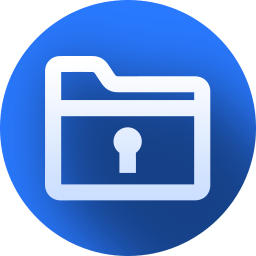 And what program can best and fastest recover lost Truecrypt password? Dear experts Is it possible in some way to recover viped hard drive. what program can recover vipped data? And what program can best and fastest recover lost Truecrypt password? There are quite some research papers on this and all say and proof that it is practically not possible. Even the developpers themselfs of those so called-millitary graded methods have explained why that is and why those methods are complete overkill (almost litterly, because they actually deteriate your drive way faster!) on modern drives. I know there will be some (paranoid?) people disagreeing with this. But all I can say to them is: google it and read those papers (incl. from the makers of those millitary graded methods no less) and research. Any word on the duration of the license and/or upgrades? Marky, In my guess, It should be lifetime because it isn't a service depending on any online activity, also because they didn't specify any time limit and especially because they had a portable version, I don't remember seeing any portable version with a limited time duration before.